Multicoated, specially engineered lenses and high-eyepoint design ensure a sharp and comfortable view, whilst fiberglass-reinforced polycarbonate resin dramatically reduces the weight of the body, making them perfect for use in any terrain. 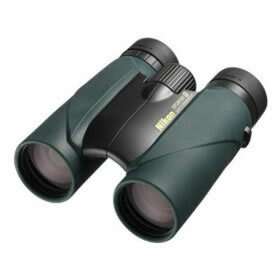 High-performance binoculars with 10x magnification and 42 mm objective lens. 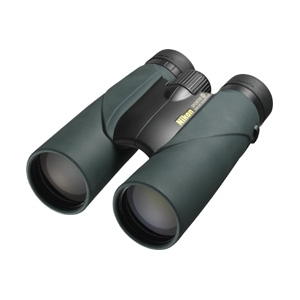 Combining superb optical quality and durability, these binoculars are ideal for activities such as trekking and nature watching. The compact and lightweight body is covered with a rubber coating for a secure grip. Multilayer-coated lenses provide bright, clear images, even in low-light. The high-eyepoint design ensures a clear field of view and comfortable use, even when wearing glasses. Waterproof (up to 1 m for 10 minutes) and fog-free with O-ring seals and nitrogen gas for added resistance to the elements. High-eyepoint design provides a clear field view, even when wearing glasses. Multilayer-coated lenses deliver superior light transmission for bright, clear images with well-balanced color. Close-focusing distance of only 5 m. Turn-and-slide rubber eyecups with multi-click system make it easy to position your eye at the correct eyepoint. Eco-glass optics, free of lead and arsenic, are used for all lenses and prisms.